While most Americans don't enjoy the process of doing their taxes, once those returns are fired off, the majority at least have something to celebrate in theory: a tax refund. In recent years, roughly 80% of filers have walked away with a tax refund, and that's money a large chunk of U.S. adults heavily rely on. But all of that might change during the 2019 tax season. In fact, 37% of Americans think they'll end up owing the IRS money on their taxes this year, according to newly compiled data from Jackson Hewitt. 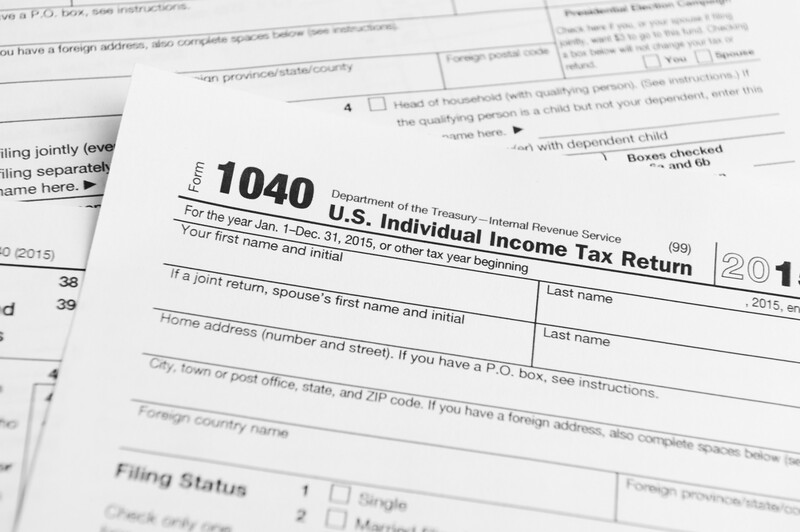 If you're used to getting a tax refund, prepare for the possibility that for the first time in a long time, the opposite holds true -- and start scrounging up that cash as needed. The 2018 tax overhaul made a lot of changes to the tax code, one of the most significant of which was lowering virtually all individual tax brackets so that working Americans would wind up with more money in their paychecks month after month. So the withholding tables used by employers to dictate how much tax to reserve from workers' paychecks were updated as well. The goal of tax withholding is to create a scenario where you have just enough tax taken out of your paychecks so that come tax time, you don't owe the IRS money, and it doesn't owe you money, either. The amount of tax you'll have withheld will depend heavily on the number of allowances you claim on your W-4 form -- namely, each allowance you claim will reduce the amount of tax withheld from your paychecks during the year. You can claim allowances for yourself, your spouse, and your dependents, for example. But the withholding system is an imperfect one, namely because the allowances you claim might easily result in an underpayment or overpayment of your taxes. For example, if you claim all of the allowances you're entitled to, but earn additional income, you might end up owing the IRS money during tax time. Historically, however, that hasn't happened for most tax filers, which is why refunds are so common. But thanks to the new withholding tables that took effect in 2018, many workers likely had less tax taken out of their paychecks month after month. Therefore, the amount they're expecting in a refund might have been paid to them already. Furthermore, nearly 60% of workers didn't update their withholding for 2018. If you were one of them, and you noticed a substantial increase in your take-home pay without a major salary boost, then chances are, you didn't pay enough taxes during the year. That means -- you guessed it -- you might owe the IRS money when you file your taxes in April. Now this isn't to say that all workers who saw an uptick in take-home pay will be on the hook for taxes this April. But more Americans than usual will need to prepare for that likelihood. "With this year's new tax rules, almost all taxpayers will see changes. Some taxpayers will see more benefits, and some will experience less," says Mark Steber, chief tax officer at Jackson Hewitt Tax Service. "Don't overlook taxes paid via withholding and estimated payments throughout the year -- this has a direct impact on tax refund size or a possible balance due." So how will you know definitively whether you owe the IRS money? It's simple: Complete your tax return. If you run the numbers and determine that you owe the IRS money, you'll only have until the April 15 tax deadline to pay that bill in full before interest and penalties start to accrue, so the sooner you figure out what your tax debt is, the sooner you can devise a plan to come up with the cash. Keep in mind that you're allowed to file your return ahead of the deadline but pay your tax bill later on. You won't accrue interest and penalties until April 15 has come and gone. While most of us would rather not owe money to the IRS, keep in mind that a small bill during tax season isn't such a terrible thing. In fact, in some cases, it's actually preferable to a tax refund. When you receive a large refund, it means you gave the government a substantial interest-free loan and deprived yourself of money you could've used throughout the year. On the other hand, if you end up owing the IRS during tax season, it means that you benefited from that money earlier on. Now you generally don't want to land in a scenario where you owe the IRS thousands of dollars come tax time. But if you file your return this year and see that you underpaid your taxes by $300, that's not such a terrible thing. Remember, your goal is to pay the IRS just enough tax so that it doesn't owe you money, and you don't owe it money, when your return gets filed. Breaking exactly even is next to impossible, but underpaying or overpaying your taxes ever so slightly means you actually nailed your withholding pretty well. On the other hand, if you wind up with a huge tax bill or refund this year, it means you'll need to adjust your withholding for the 2019 tax year. Otherwise, you're likely to either lend the government money interest-free once again or land in a scenario where you're stressing over your tax bill next year.